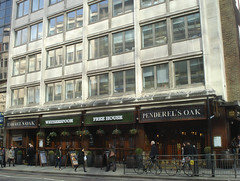 Busy, popular Wetherspoons pub in Holborn. It gets rammed on a Friday evening, but remains a good place for a meeting (except perhaps on a Friday night), since it is very large. There is another substantially-sized bar downstairs, which is often fairly empty (again, except on a Friday evening). Plenty of real ale on handpump, low Wetherspoons prices. In July 2008, it was London Pride, Greene King IPA, Abbot Ale, Pedigree, Exmoor Gold, Ossett Silver King, Oakham Ales Helter Skelter, Woodforde's Sundew and Outlaw Wild Mule (£2.29/pint). Also Weston's vintage cider on handpump, and plenty of other ciders available in bottled form. Food is served, standard Wetherspoons menu with the usual offers. When secretlondon visited in May 2016 it was packed on a weekday evening, in both bars. Beer was £3-something a pint. A disabled toilet (I think with a radar lock) was on the ground floor. The normal toilets are downstairs next to the cellar bar. Last visited by secretlondon and others, May 2016. Opening times taken from the Wetherspoons website, March 2015. Last edited 2017-09-15 18:27:04 (version 30; diff). List all versions. Page last edited 2017-09-15 18:27:04 (version 30).